Grommet Style for use in Plastic Air Filter Housings. The AFGR2D5 measures the Vacuum restriction caused by the contamination of the Air Filter. 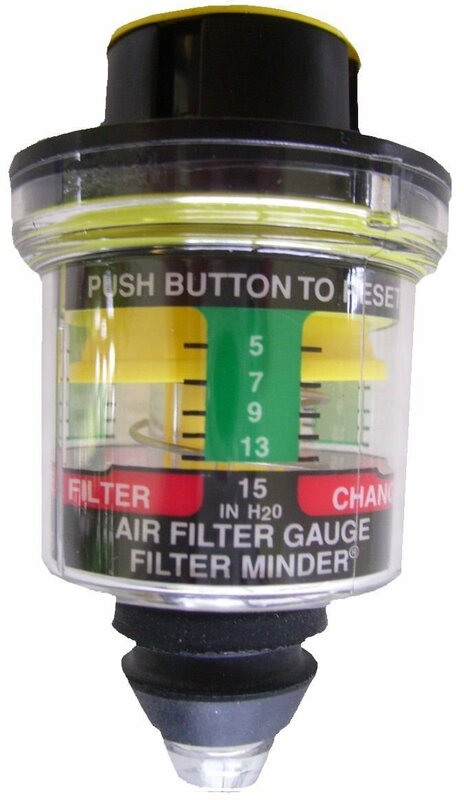 As the internal Yellow Diaphragm moves down through the GREEN zone on the Gauge, The Air Filter is becoming increasingly contaminated. When the Yellow Diaphragm approaches the RED zone.... Change the Air Filter. The gauge locks in position, so you can read it with the Engine OFF ! Push the Yellow Button on the top of the Gauge to reset it. It is that simple. STOP guessing when to change your Air Filter. AMERICAN EXPRESS can be used through PayPal only. PayPal can also be used for All other credit cards and should be used if you are having a problem getting your credit card processed and / or if you are out of the U.S.A. PLEASE CALL OR E-MAIL US FOR PRICING ON ANY OTHER GAUGE YOU NEED. ENTER CODE... AF15 In the Redeem Coupon Area at check out and get 15% OFF and FREE shipping.